I think there’s no doubt about it: having breakfast is very important! Every expert, diet-guru and lifestyle specialist starts with telling us about the importance of having breakfast! It turns on your internal engine and gives you energy to start the day. Although the importance of having breakfast is pointed out so loud and clear by several studies, still many people skip their breakfast and rush to work. Many of whom who do have breakfast take their sandwiches with them and eat behind the wheel while navigating through traffic. Hurry, hurry hurry! I’ve always loved having breakfast. I’m a slow starter in the morning, so I need some time to wake up and to get the motor running before I head of to work! I don’t mind getting out of bed earlier for that! I used to have sandwiches or some yoghurt with fruit in the morning, but since I try to eat less bread (gluten) and dairyproducts that has changed. I really love a a powerful smoothie in the morning with fresh fruit and veggies. But every once in a while I make myself a bowl of warm miso soup in the morning! 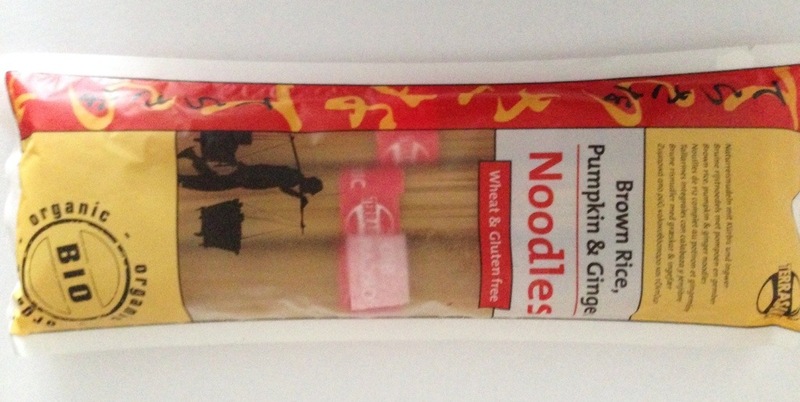 You might think: soup…? for breakfast…? Misosoup is a traditional Japanese breakfast dish, and it’s known to give energy and to boost up your digestion. 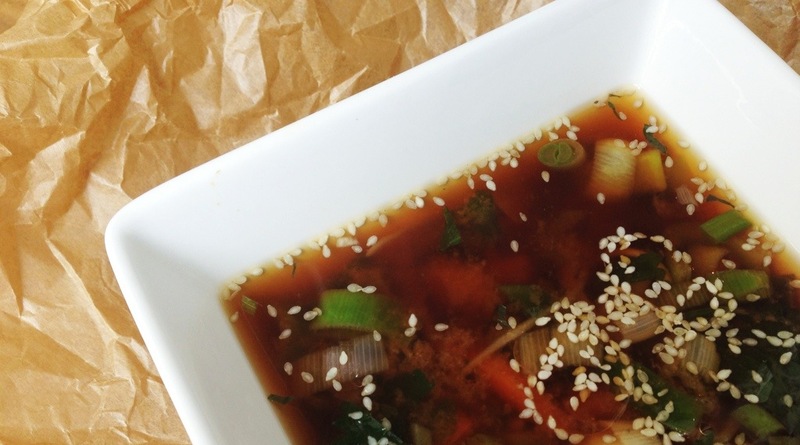 Because you can add loads of veggies to your miso soup it contributes to your daily amount of vegetables and their beneficial vitamins and minerals! The base of Miso is a mixture of fermented soybeans and salt. There are many types of Miso, each having other ingredients mixed through the paste, such as grain or rice. You can probably buy it at a local Asian Toko. 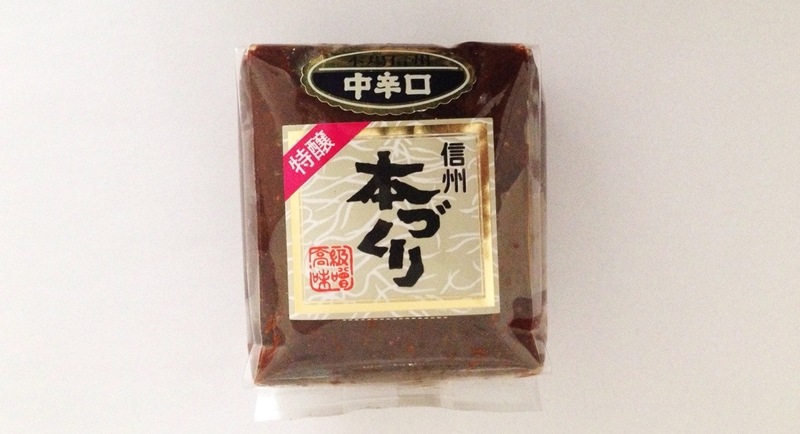 The paste has several purposes, for example Misosoup! The taste of Miso is described as ‘Umami‘ (a pleasant savory taste). You can find a lot of different recipes for Misosoup, and it’s possible to give it your own swoosh! Today I’ll present you one of my Misosoup-versions! Bring the 1,5 liters of stock to the boil and add the misopasta, fishsauce, soysauce and springonions. Boil for a few minutes to infuse the tastes. Add the noodles (break into small pieces if neccesary) and the chopped veggies and boil until the noodles and veggies are done. Taste and (optional) add some more fishsauce of soysauce to taste. Poor the soup into nice bowl and drizzle a few drops of sesame-oil into the soup and sprinkle the sesameseeds on top, serve. You can make many variations to this soup by adding ingredients you like, such as different veggies, rice, boiled or poched egg, herbs (parsley, kurkuma, koriander, etc). Just experiment and give it your own touch! Note; this soup is also delicious as lunch or for dinner! Posted in Breakfast, Diner, Lunch, recipes, Soup, VeganTagged asian, breakfast, comfortfood, dairyfree, glutenfree, healthy, homemade, lunch, miso, soup, soy, vegan, vegetable, vegetarian, veggieBookmark the permalink.